Works very well, solid construction, easy to use. Slightly plain looking - that's our only quibble. 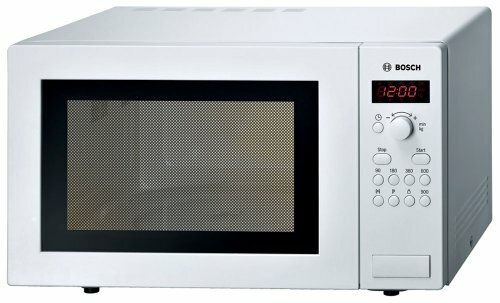 The Bosch HMT84M421B is a medium capacity (25 litre) white solo microwave, with 900w of power and a simple control system. 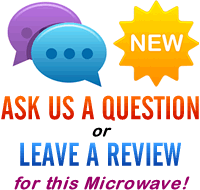 It may not be the flashest looking microwave on the market, but it performs well - essentially this is a functional solo microwave designed with practicality firmly in mind. The interior features a 31.5cm removable glass turntable, and measures 21.5cm by 33.7cm by 35.4cm internally, which according to the manufacturer provides a 25 litre capacity. 5 different power levels are included, with the maximum being 900w. These are set by the electronic control system, which is illustrated by the digital LED display. The Bosch microwave timing system goes up to a maximum of 99 minutes, which you can set to the nearest second for precision control. Our testers liked this model - it defrosted and cooked well during the testing period, as well as being both easy to operate and clean. So what did we think overall? Overall the Bosch HMT84M421B is very easy to use, and cooks beautifully. Essentially it's a functional and practical medium capacity microwave - it might not be the most stylish looking microwave, but it performs admirably.